Mitki, an association of artists in the northern capital, presents new artwork aimed at eliminating the ideological split in Russian society through artistic endeavors. Tsar Ivan the Terrible kneels on the Persian carpet. A crowd of people in sailors’ undershirts flocks into the tsar’s chamber. They bring a baby in swaddling clothes and hand him to the tsar. This is the painting “Mitki Presents New Son to Ivan the Terrible” by a St. Petersburg art group determined to and “have no wish to get the better of anyone,” according to their motto. The idea behind the painting is that presenting Ivan the Terrible with a new son to replace the one he had killed, society’s divisive wounds will heal. The Mitki art group emerged in St. Petersburg in the early 1980s. They wear sailors’ striped undershirts, profess a good-natured and contemplative worldview. The Mitki philosophy is shared by many Russian stars: writers, musicians, and even the chairman of the Federation Council, Valentina Matvienko. When she was the governor of St. Petersburg, she once dressed in a sailor’s undershirt and appeared at the Mitki studio. The movement was named after one of its founders, the painter Dmitri Shaguin. Mitki is the plural form of the diminutive for the name Dmitri. The Mitki have a rich experience in the reconciliation of various hostile sides: not only do they have no wish to get the better of anyone, they also want to bring all people together. The group’s previous paintings were meant to be of a similar conflict reconciliation genre: “Mitki Present Their Ears to Van Gogh” and “Mitki Take Away Vladimir Mayakovsky’s Pistol.” These paintings play off the stories of Van Gogh cutting off his ear, and the Russian poet Vladimir Mayakovsky, who shot himself. Ivan the Terrible is attributed with atrocities and outrages against his own people. Still, others believe that he was a truly great tsar, who expanded the territory of his country. If we run historic parallels, his closest equivalent might be King Henry VIII of England. The pro-Western part of Russian society has an extremely negative attitude towards Ivan the Terrible, while the old school and orthodox fundamentalists idolize him in many ways. Legend says that his crimes include the murder of his own son. Many centuries later, in the latter half of the 19th century, Ilya Repin, the master of Russian realism, depicted this episode on canvas. After the painting was completed, Tsar Alexander III took a disliking to it. In his opinion, the painting not only represented his ancient companion disparagingly, but also is not true. Certainly, at the end of the 19th century it was impossible to prove that the son of Ivan the Terrible had died by other means, but the emperor’s intuition proved true: in 1963 the tombs of Ivan and his son were opened, and forensic tests proved that levels of mercury, arsenic and lead in the remains of tsar’s son exceeded the norm by some 33 times. This was clearly the cause of his death, and he did not die at the hand of his father. One way or another, in 1885 Alexander III forbade the showing of the painting, but permitted it just three months later — liberal times had come to Russia. In 1913 Repin’s masterpiece was damaged by the Old Believer icon-painter Abram Balashov. He stabbed the canvas with a knife three times, two more strikes than legend states Tsar Ivan made to kill his son. There is a story that Khruslov, the then custodian of the Tretyakov Gallery, threw himself under a train when he learned of the incident with the canvas. Exactly 100 years later, in quite another era, the story of Repin’s painting unexpectedly has its continuation. 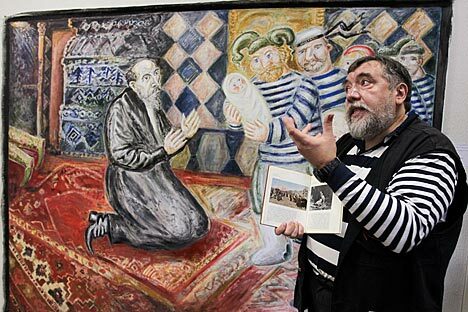 In October this year, Orthodox businessman Vasily Boyko-Veliky demanded that the painting be withdrawn from the Tretyakov Gallery so as not to corrupt the minds of a Russian youth. Boyko-Veliky, who wrote an open letter to the Minister of Cultural Affairs and to the director of the Tretyakov Gallery, is a leader of the ultra-spiritual public movement Rus Velikaya [Rus the Great]. He is also the owner of a dairy plant, where he demands that all his employees are baptized and complete a course in Orthodox culture. He dismisses employees who have not been married in a church ceremony, unless they head to the altar to tie the knot there and then. As one would expect, the director of the Tretyakov Gallery reacted negatively. Nobody would remove the canvas from the wall, where it has hung for many decades. “I do hope that the authors of the letter were joking. But let’s be frank, jokes don’t always turn out to be very funny,” Vladimir Medinsky, Russian Minister of Culture, said. The Mitki resolved to answer a bad joke with a good one. It is not certain that Boyko-Veliky and his companions will understand it, but at least it is a good-natured joke.